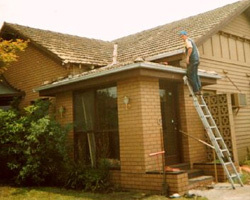 A leaking roof can wreak havoc in your house in a very short time. Signs of a leaking roof range from visible water through to stains, dampness and mould. Woolleys Plumbing are experts in identifying leak sources and fixing the problem – FAST. We can also repair or renew spouting. If you have a leaking roof or suspect a leak is occurring, call Woolley’s Plumbing on 1300 367 626 for prompt, professional service.